Shayne and Blaise received their Flyball Dog Master title, and their Agility Association of Canada, Veteran’s Advanced Agility Dog Title. Shayne and her dogs since Blaise have received 100′s of placement ribbons in Flyball, Agility, Rally-O, Dock Diving, and k9 Disc. 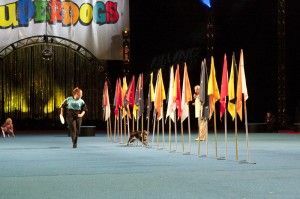 Shayne has traveled across North America with her mother and father participating in SuperDog Shows. Today she is a star in her own right – having earned her place on the SuperDogs Team. She is very pleased with her first place win in the Dog and Horse Relay at The Royal Winter Fair 2012. Shayne is very fortunate to have grown up around the best trainers in the dog training industry, and to have gained a wealth of knowledge from them. 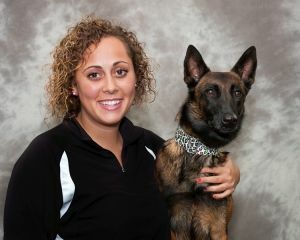 Shayne manages the training program at K9 Central and is an instructor in the basic training programs. Shayne also teaches sports classes including beginner and intermediate agility. As well, Shayne also provides behavioral and aggression privates and has worked with many dogs with behavioural issues and/or reactive dogs, and has helped teach owners how to deal with and manage these dogs in every day life. Shayne also assisted Joan Weston for a semester of the Animal Behavior, Handling and Restraint course run by Durham College. She is currently enrolled in the Karen Pryor Academy Dog Trainer Professional Certification Program. Shayne shares her life with a rescue border collie, KaBoom, three belgian malinois named Envy, Bling and Allure, and a beautiful little staffordshire terrier, Karma.